Flyscreen mesh can be a very convenient accessory for protecting all sorts of odd little gaps in a building. It’s extremely useful behind cladding where screening is required to prevent critter infestation via the ventilation gap, and it is widely used in roofs to protect all manner of openings from birds and insects. One of the good things about mesh is its flexibility and its ability to fill areas not suitable for pre-formed ventilators. One of the disadvantages of mesh is also its flexibility. As the photo below illustrates it doesn’t take long for some mesh to start sagging if it’s not fitted securely. Consider the gauge of the mesh. A very fine mesh will quickly become blocked with airborne dust and debris restricting the path of air and the amount of ventilation available. Finer mesh also requires regular maintenance checks and cleaning, which may not be practical given the awkward nature of most mesh placements. Consider what material the mesh is made from. Plastic and metal mesh types are generally quite rigid and therefore self-supporting whereas a fabric-like mesh, like the one pictured, is softer and may be more prone to sagging. Use more fixings than you think is needed to prevent the mesh dropping over time. Don’t forget it may get the odd peck and pull from a bird or two so needs to be secure. Rytons Mesh is made from high density polyethylene, a lightweight yet very strong material. 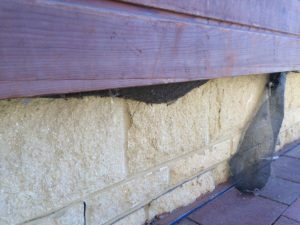 It features 4mm x 4mm holes, which allow a good air flow whilst preventing the entry of birds and larger insects. It is weather resistant and corrosion proof for a long lasting mesh requiring minimal maintenance checks. Find out more here.